We're seeing a noticeable change in the weather here. Days are getting shorter, nights are a tad bit chillier, and we can comfortably keep the air off and doors open most days. Y'all, it's almost fall. I know that probably puts a spring in most of your steps, but I mourn the death of summer. I'll take beach days over pumpkin patches and cold smoothies over pumpkin spice lattes. Actually, if we could hold off on pumpkin spice everything for a little longer, I'd be cool with that, thanks. 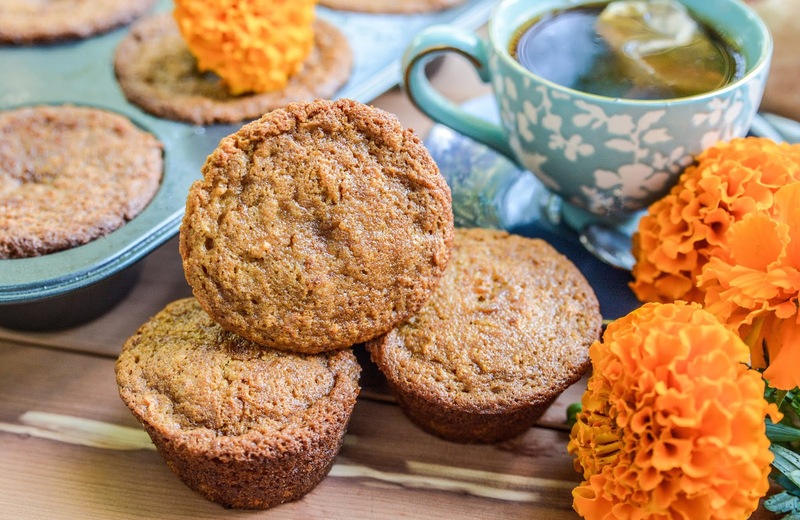 I will admit, though, that I did have a slight craving for something fall flavored (hold the pumpkin, please) and ended up whipping up a batch of Sweet Potato Muffins from Golden Blossom Honey's recipe page earlier this week. I always have sweet potatoes on hand because they are one of my favorite foods, but this is a first for me to incorporate them into baked goods. I simply microwaved the potato for 5 minutes, which make the pulp scoop away from the skin easily, and result was a muffin that baked up soft, moist, and delicious. These muffins are so good right out of the oven, but are yummy for breakfast too. I just pop one in the microwave for 20 seconds or so, then enjoy with a steaming mug of tea. Mmmm! If you're itching for fall to hurry up and roll around, put these muffins on your radar. Even if you're not, like me, make them anyway. They are delicious and I bet you end up loving them! Are you looking forward to fall or do you want summer to stick around a bit longer? Living in the south, I imagine it's still pretty hot there. Gorgeous photos, lovely cups, how do you call those flowers? We call them 'kadifa' here. Your air is off???? We're experiencing the worst of summer right now, can't remember a day my air wasn't on, but they do say we will have a refreshment next week, can't wait! We call them marigold flowers. I haven't had my air on for most of the week. I'm actually covered in a light blanket right now. Please send your heat my way. I am not ready for these cold temps yet! Never knew potatoes could be incorporated like that. Fall does seem to be coming, but give it a few weeks, heat wave will probably come back. I'm fine with fall, but the closer that gets the more we get crummy snow near. I never ate them growing up, but as an adult, I can't get enough! Those look super tasty! I love muffins, and I love sweet potatoes. This looks perfect to me. It's a great combo, right?! 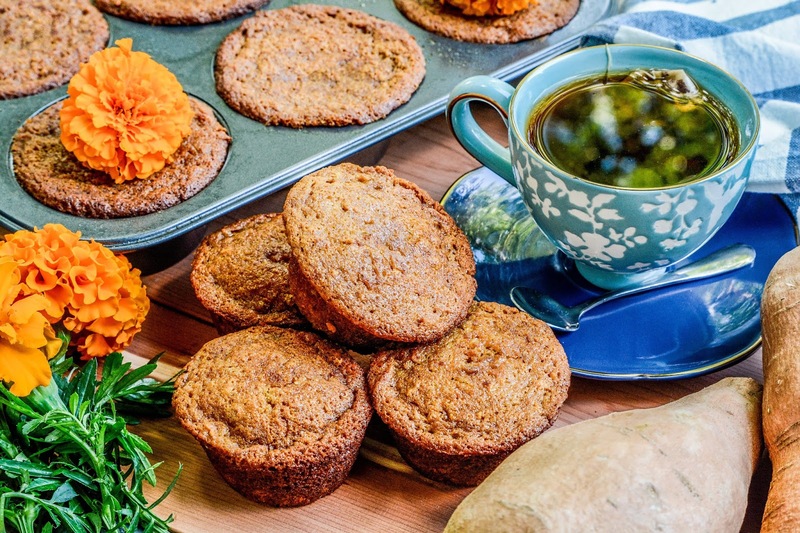 Sweet potato muffins sound like the perfect way to start the day. Muffins are always a tasty breakfast, and sweet potatoes are a super food. A yummy way to start the day, for sure! Do you grow potatoes in your garden, Alissa? I know you do other things, but I don't recall potatoes on your list. Humidity really does make summer less appealing. Thankfully, it doesn't get too humid in Indiana. Just a short while and that's it. My husband doesn't enjoy sweet potatoes much but I wonder if he would like this. We love having muffins in the morning for breakfast. You know, you really can't taste the sweet potato in it. It just gives it a moist consistency. It's more sweet and cakey than bland like the potato. I've never made sweet potato muffins. These look delicious! 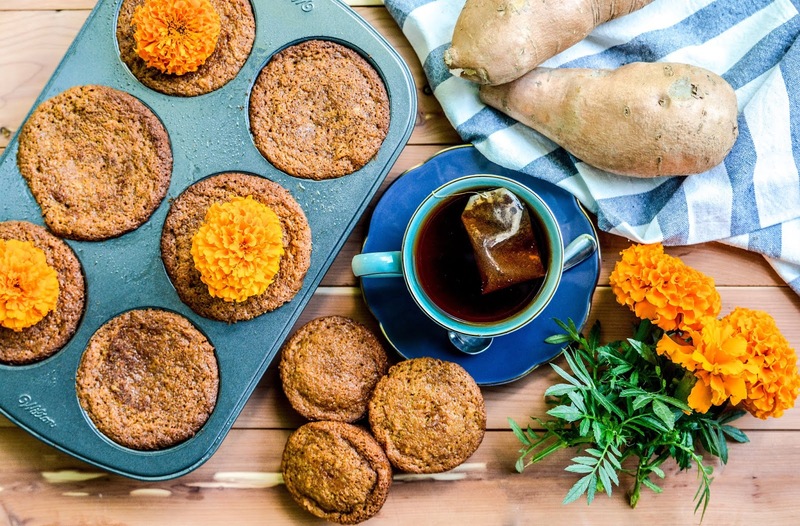 I never thought sweet potatoes could be used in muffin recipes! I always thought it would be fruit or nuts of some kind. I will have to try your recipe. This looks really delicious! It was a mind blower to me too! Who would have thought to put a sweet potato in a muffin? I am a summer girl. I love the colors of fall and the electric bill going down but I dont like cold weather. Sign me all the way up! I had sweet potato pie but dont remember ever having sweet potato muffins sounds delicious! I can imagine the delicious smell, Theresa...perfect for breakfast!